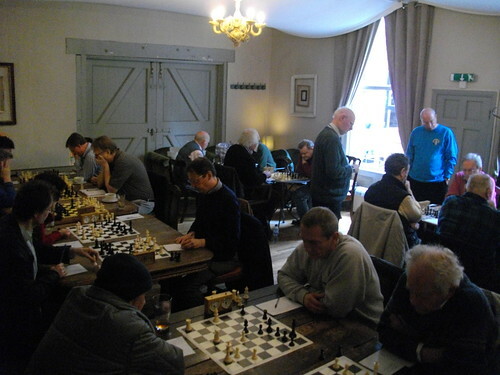 Paul Robertson blogs: "Middlesex v Kent (17 March 2012), The Southern Counties Chess Union inter-county under-140 fixture, played in the Garden Room at the Pilot pub in Chiswick. Just round the corner from me (which was handy, as I didn't have a long walk home to reflect on my ignominious loss on board 8)." - The January 2012 grading list now includes standard grades and regular updates as well as rapidplay grades - http://www.ecfgrading.org.uk/ and we have Mike Bennett of Hendon Chess Club to thank for the improvements - try them out! This will not affect Middlesex League matches - we will still be using the July 2011 list, except where previously ungraded players appear on the new list. Formula Leagues will still use the July 2011 list to determine eligibility. However the new grading list should be used to determine board order within the existing league rules - see point 16. - Nick Collacott needs Under 160 players for the County Team - see here for regular reports of our county matches. - Angela Eyton is the Captain for the U140 county team - details and fixtures for SCCU county chess can be found on the excellent SCCU website. Hendon Chess Club has moved! From the 23rd February the new venue is Golders Green Unitarian Church, in Hoop Lane NW11 8BS. The regular monthly Blitz tournament will also move there from 1st March, and will now be FIDE rated! Golders Green Rapidplay remains where it has always been held, at St Albans Church Hall. - There is a new venue for Middlesex County home matches at the Pilot, Chiswick. Angela has kindly been hosting some home matches at the Hall School at Swiss Cottage, which has proved a very popular venue. - In case you missed it, here are the results of the Middlesex Individual Summer Tournament 2011. If you are interested in organising or taking part in this year's event contact me. - 22 Nov 2011 - Bruce Birchall passed away recently (thanks to Simon Spivack for bringing this to my attention). Bruce was a former secretary of the Middlesex League and match captain. He was a diabetic and had been in poor health for some time. - Middlesex Postal (and e-mail) Team needs you! If you would like to have a go at playing postal, e-mail or web server chess for Middlesex please contact our Captain, Andrew Chamberlain, (a-chamberlain1@hotmail.com). 20 Sep 2011 - The English Chess Federation Counties Rapidplay Championships is taking place this Saturday 24th September 2011 at Wanstead House, 21 The Green, E11 2NT. Players will play four RATED rapidplay games between 13:30 and 18:30, each lasting for 30 mins (per player). Thanks to Peter Ackley for organising the team, and good luck!